Build-Outs Of Summer: Peace Co..
European Baristas Form Guild, .. 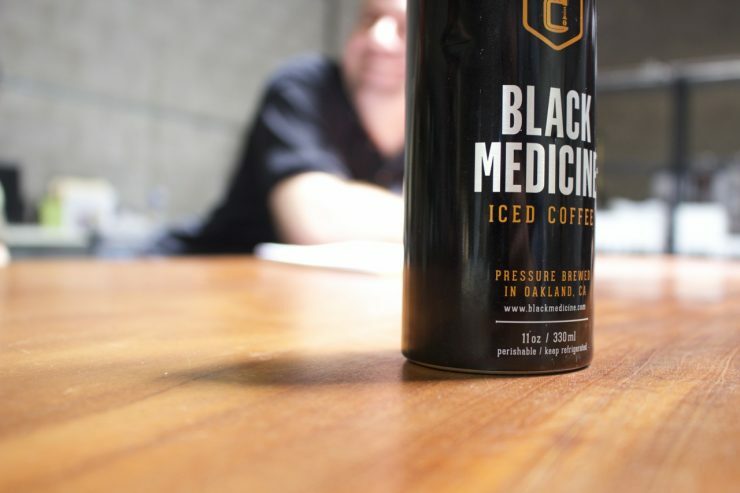 I first saw the slick aluminum bottles of Black Medicine Iced Coffee at Grand Fare, a cafe in the Grand Lake neighborhood of Oakland that an intrepid team of coffee folk used to operate under the name Monkey Forest Road. This team is now the force behind Black Medicine, and when Chris Bukowinski invited me out to see the production space where this bottled, nitrogen pressure brewed, Vitamin C containing iced coffee drink is made, I leapt at the chance. Their roasting, brewing, and bottling facility, now on 81st Street in East Oakland, past the Coliseum, is next to the biggest U-Haul facility I’ve ever seen in my life. You could call Black Medicine a passion project of Chris Cooper, its founder and owner. He left the tech and stock-trading world (he founded and sold Quote.com) in order to try to create the perfect cup of coffee. He’s gone so far as to design, engineer, and build his own brewing equipment. Cooper then brought Ricardo Alvarez, Chris Bukowinski, and Daniel Petrie over from Monkey Forest Road. All have spent around a decade or more in the Bay Area coffee scene at places like Peet’s, Blue Bottle, and others. The team created a secret brewing process to realize their perfect iced coffee dreams. Black Medicine first buys green beans from importer Coffee Shrub. Right now it’s a blend of a Costa Rica Helsar and two Ethiopian coffees–a Yirgacheffe Konga and an Aleta Wondo. They adjust the blend seasonally, roasting on site with a Fresh Roast. This trick little roaster browns beans based on laser color analysis–it’s made by the same company that makes fancy digital coffee roasting analysis tools like the ColorTrack. It also has a built in air filter, so no vent is required. Once the coffee is roasted, the details get more secretive, as Black Medicine wants to keep their proprietary brewing system, well, proprietary. What we know is this: coffee is first ground on a big Ditting grinder, and then pressure brewed in a large stainless tank, which we’re advised is a “nitrogen environment” to minimize oxidation. When I asked Cooper if the process is similar to making espresso, he would just agree that, “It’s kind of like that.” The filtering system does not use paper, but the cup’s (or bottle’s) final product is considerably clean. In the current blend, it’s juicy, fruity, and complex. Vitamin C is added to the final product in order to extend shelf life. The Black Medicine crew assured me that there was no tangible taste difference. It’s only 17 percent of your daily recommended dosage, approximately 1/100th of an Emergen-C. That helps the product stay good for two months when kept refrigerated. Cooper was insistent that hot, pressure brewed iced coffee produces a better, more nuanced and complex product than a cold-brew process. He said, “Cold brew all kind of tastes the same.” Since this is not only a passion project, but a business, Cooper also wanted to focus his engineering know-how on finding a method that could scale up volume easily. Monkey Forest Road acted a testing ground for the brewing method and the product. The café sold it for two years–Chris Bukowinski, the manager of that café, and of Black Medicine, says at one point during last summer the bottled iced coffee was making up nearly a third of the café’s daily take. Right now, Black Medicine has a bunch of high-profile clients in the Bay Area, including Bi-Rite Market and the Berkeley Bowl. Like other shelf-space competitors–including the Stumptown and Blue Bottle iced coffee products–Black Medicine is working to deliver a specialty coffee product in an extraordinarily accessible single-serving package in larger markets that aren’t traditionally where you find specialty coffee. They’re currently in negotiations with distributors to get their product into many more stores. Some day, probably not too far down the road, you might be able to find Black Medicine’s mysterious, vitamin-enhanced, pressure-brewed, mysteriously nitrogen-coddled iced coffee–or another local micro-producer’s specialty iced coffee product–in your local 7-11, WalMart or Sheetz. Maybe not today. Maybe not tomorrow. But maybe someday. A little bottle of coffee can dream, right?